Here we are, on a Sunday, on the Sabbath day, and here we have this passage from the gospel of Mark, about the Sabbath. Seems like it may very well be the proverbial preaching to the choir, you’re all here, observing the Sabbath, what more is there to say? There actually is a lot more to say in this Sabbath story. Jesus makes us whole. In this world that pulls us apart, that breaks our hearts, Jesus makes us whole. Jesus was taking a big risk, a huge chance in this Sabbath story. One Sabbath Jesus and his disciples were walking through the grain fields, and his disciples began to pluck the heads of grain. No big deal you and I think, we do it all the time. At least I do, on a Sunday afternoon, walk around my yard and my garden and pluck the weeds right outa there. But the Pharisees are watching Jesus so carefully. In fact, they seem to be doing an awful lot of hanging around just to catch him in the act. You see, Sabbath observance was one of the fundamental characteristics of the Jewish people, marking them off from other groups of the day. So a challenge at this point is no small matter. And that’s essentially what Jesus is doing here, intentionally or not; Jesus and his followers are challenging the Pharisees. It seems that the Pharisees care more about their custom than they do about their brother: they are more eager to bring Jesus down than to restore this man’s useless hand. In Mark’s gospel, argument about the Sabbath played a critical role in the life of Jesus; indeed, it was one of the factors that led to his death. And, Sabbath observation was a burning question at the time the gospel was written, when the Christian movement was still separating from the synagogue. So these questions about what is lawful on the Sabbath at the time were legitimate questions. Is it lawful on the Sabbath to do good, to save life? Or, by ignoring the need for healing, to harm life? This drove Jesus to anger. Jesus regards the Pharisees attitude as hardness of heart, they were stubborn, closed minded. They placed religious vigilance above concern for human need. They place the law above the wholeness and healing that Jesus offers. So what does this Sabbath story have to do with us? I remember the days, I don’t think they are so very far in the past, when Sundays, were for church and for Sunday dinner. I’m from a mixed marriage. Some of you remember the days when mixed marriage, that was marriage between a Lutheran and a Catholic, meant that the Lutheran signed a promise to raise the children in the Catholic church. Now I come from a large family, I’m five of eight. My mom would pile us all in the station wagon, and we were putting on our shoes and our hats and probably our gloves, as she was yelling at us to get in the car. We’d get to church; we’d empty the car like the Shriners at a parade, file into the church and take up a whole pew, just like all the other families. After church we’d all pile back into the car for the very short ride home. My dad never came with us on those Sabbath Sundays. Years later, when he did decide to be a Catholic, I learned that his agreement to raise us Catholic was to stay home with the very youngest ones so that my mom could get the rest of us to church. The Sabbath Sunday wasn’t necessarily relaxing, but it was part of church and family that was joyful and broken and messy. And, the culture of the time supported this. There was no shopping on Sabbath Sundays, because there were no stores open, because the law wouldn’t allow it. This is a rather nostalgic story, but I do think there is something to it. The human body and psyche need regular times of rest for rejuvenation, and for getting put back together. And it’s not just about the law even though Jesus challenges every form of legalism that reduces religion to the keeping of rules. It’s also about all the stuff that fragments us. Sometimes, family and friends disappoint, maybe even break our hearts. Sometimes, work is impossible, maybe even breaks our spirit. Sometimes, the violence perpetrated in our schools makes us fearful, we may even despair. And even with our broken hears, our broken spirits and our despair, Jesus makes us whole. The good news is that this passage from Mark isn’t all about making you feel guilty about church attendance; actually, it’s not about guilt at all. It’s about what God does in and through Jesus. It’s about God’s gift of wholeness, of healing, and of love. The good news is that Jesus makes us whole. Within this story is Jesus’ story about David. The point of Jesus’ story about David is that scripture itself admits of exceptions to the law. The Sabbath was made for humankind, and not humankind for the Sabbath. This grounds Sabbath law in the welfare of humankind. It challenges every legalism that makes of the Sabbath a burden to bear rather healing, wholeness, and love. Jesus is lord even of the Sabbath – this not only affirms the authority of Jesus, the son of man, to reinterpret Sabbath law, but asserts also that the Sabbath remains God’s day. Jesus determines the proper use of the Sabbath. Jesus best knows human needs; as God, Jesus has the authority to say how the Lord’s Day should be used. Jesus shows us that the Sabbath is created for healing, for wholeness, for love. Risen lord, be known to us in the breaking of the bread. You see, what we do when we gather in this place, and in places around the world, has everything to do with the lord of the Sabbath, the Lord who heals, the Lord who makes us whole, and it’s not so much about law as it is about love. We come, we make room, space is opened in our hearts, sometimes by choice, often because our hearts are broken. The ways of the world have left us broken, pulled apart, isolated, and love seeps in. It seeps in with bread and wine. Love seeps in through song and prayer and hugs and handshakes. We come with broken hearts, we come with streaming tears, and those tears remind us that in the waters of baptism we die and are raised with Jesus. Jesus makes us whole, Jesus actually makes us new on this Sabbath. You who are broken by the ways and wills of the world, Jesus makes you whole. You who are broken by the cares and concerns of this community, Jesus makes you whole. You who are broken by the extremes and excesses of economy, Jesus makes you whole. Take the Sabbath story out with you. God shows up in this place, and for a time we rest in these pews, and then we are sent out. We bring our new selves, our selves that Jesus has put back together, out into our work, our schools, our neighborhood. 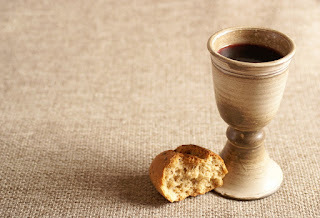 We bring our newly constituted selves, put back together in the bread and the wine, the body and the blood, our holy selves, made so by the one who is risen. Thanks be to God. Here we are, on a Sunday, on the Sabbath day, and here we have this passage from the gospel of Mark, about the Sabbath. Seems like it may very well be the proverbial preaching to the choir, you’re all here, observing the Sabbath, what more is there to say? So these questions about what is lawful on the Sabbath at the time were legitimate questions. Is it lawful on the Sabbath to do good, to save life? Or, by ignoring the need for healing, to harm life? This drove Jesus to anger. Jesus regards the Pharisees attitude as hardness of heart, they were stubborn, closed minded. They placed religious scrupulosity above concern for human need. I remember the days, I don’t think they are so very far in the past, when Sundays, were for church and for Sunday dinner. I’m from a mixed marriage. Some of you remember the days when mixed marriage, that meant marriage between a Lutheran and a Catholic, meant that the Lutheran signed a promise to raise the children in the Catholic church. Now I come from a large family, you all know that, I’m five of eight. My mom would pile us all in the station wagon, and we were putting on our shoes and our hats and probably our gloves, as she was yelling at us to get in the car. We’d get to church; we’d empty the car like the Shriners at a parade, file into the church and take up a whole pew, just like all the other families. After church we’d all pile back into the car for the very short ride home. My dad never came with us. Years later, when he did decide to be a Catholic, I learned that his agreement to raise us Catholic was to stay home with the very youngest ones so that my mom could get the rest of us to church. The day wasn’t necessarily relaxing, but it was all part of this messiness that was church and family. And, the culture of the time supported this. There was no shopping on Sundays, because there were no stores open, because the law wouldn’t allow it. I don’t think this is all about nostalgia, but I do think there is something to it. The human body and psyche need regular times of rest. It’s not just about the law even though Jesus challenges every form of legalism that reduces religion to the keeping of rules. We are so busy, and so much calls our attention away from rest and listening. You all know this; in fact, I’ve heard many of you speak of it recently. The 24-hour news cycle that is driving us all crazy. Your phone pings every time a news report comes in. You are updated every time one of your friends posts a picture, or eats at a new restaurant. We have to remember to turn our phones off when we come to church, or go to a concert. And it is increasingly difficult to discern the real from the fake. Our electronic lives tend to pull us apart, we are pulled apart from one another, and we are fragmented and isolated. The good news is that this passage isn’t all about making you feel guilty about church attendance; it’s not about guilt at all. Within this story is Jesus’ story about David. The point of Jesus’ story about David is that scripture itself admits of exceptions to the law. The Sabbath was made for humankind, and not humankind for the Sabbath. This grounds Sabbath law in the welfare of humankind. It challenges every legalism that makes of the Sabbath a burden to bear rather than renewal for the road. Jesus is lord even of the Sabbath – this not only affirms the authority of Jesus, the son of man, to reinterpret Sabbath law, but asserts also that the Sabbath remains God’s day. Jesus determines the proper use of the Sabbath. Jesus best knows human needs; as God, Jesus has the authority to say how the Lord’s Day should be used. So to rightly observe the Sabbath is not only to rest and worship but also to do good, to save life, to make life whole, both our own and that of our neighbor. The principle suggests to followers of Jesus that Sundays be spent not in self-indulgence nor in self-denial, but in renewal and in service, in healing, as Jesus did on the Sabbath. Risen lord, be known to us in the breaking of the bread. You see, what we do when we gather in this place, and in places around the world, has everything to do with the lord of the Sabbath, and it’s not so much about law as it is about love. We come, we make room, we open space in our hearts, sometimes by choice, often because we have been broken, and love seeps in. It seeps in bread and in wine. Love seeps in through song and prayer and hugs and handshakes. We come with broken hearts, we come with streaming tears, and we are reminded that it is in the waters of baptism that we are risen with Jesus. And we are healed, we are actually made new on this Sabbath. And we take the Sabbath out with us. God shows up in this place, and for a time we rest in these pews, and then we are sent out. We bring bread and wine to those who cannot leave their homes to come here. We bring our new selves, our selves that have been put back together, out in the world in service to others. Our newly constituted selves, put back together in the bread and the wine, the body and the blood, our healed selves, made whole by the broken body of Jesus, our holy selves, made so by the one who is risen, go out into the world to stand with those whose healing is not yet. We stand with those who have been held hostage by the letter of the law, waiting to be freed by the love that wins. We, are not perfect, sometimes we want the letter of the law, because love is so messy and hard. But we are perfectly loved, perfectly forgiven. Go out, on this Sabbath Sunday, carrying your healed broken heart, your healed brokenness, to love God, love others, and show it. Amen.